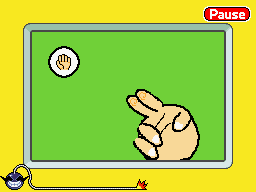 Finger Flex is a microgame available for download with WarioWare: D.I.Y. and WarioWare: D.I.Y. Showcase. It is made by OldRiver, and it was released in Japan on May 6, 2009 and in North America on April 5, 2010. It has not been released in Europe. It later returns in WarioWare Gold as one of Wario Deluxe's microgames. The goal of this game is to move a hand's fingers up or down to defeat its opponent in a game of rock-paper-scissors. The opponent has his or her hand in the shape of a "rock", "paper", or "scissors". The player must change the fingers on the big hand by tapping them to beat his or her opponent. 1st level difficulty: One finger is misaligned. The opponent is a clown. 2nd level difficulty: Two fingers are misaligned. The opponent is another clown. 3rd level difficulty: Three fingers are misaligned. The opponent is an alien. 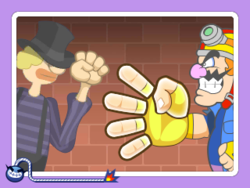 Sometimes, the player controls the opponent's hand instead, and must lose to Wario. This page was last edited on December 10, 2018, at 01:39.